Vijayawada, Jan 1 : Indian culture giving divine status to “alphabet” in Vedas is an indication of the importance it gives to books and literature, Vice President M. Venkaiah Naidu said here on Monday. Inaugurating the 29th Vijayawada Book Festival, he said books are our good friends and good books raise our living standards. “When we are in trouble, they (books) show the way. Those who are well-educated, they are highly regarded in the society… and opening a book means opening a new world,” Naidu said. 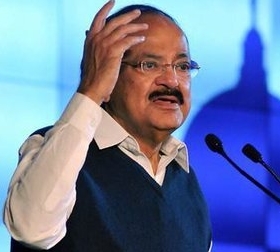 The Vice President said that even women in the Vedic times are equally involved in writing books and Gargi, Maitreya and others have written several works. He further said that there are many female writers right from the Buddhist era to Tamil Sangam era. In the Vaishnava tradition, there are even Dalits and women among Alwars who wrote books. He also said that cinema, music and other forms of art promote peace and tranquility. The Vice President expressed happiness at the fact that the Andhra Pradesh government has dedicated the year 2018 for Telugu language protection.